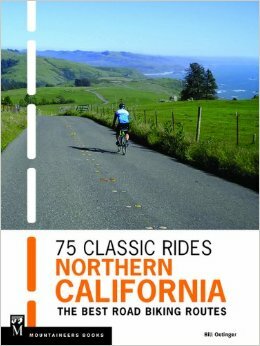 Most of the one-week tours presented here were first created as summer events for the Santa Rosa Cycling Club of Northern California. They have always been organized as group tours, with anywhere from 20 to 60 participants. To keep costs low, we use campgrounds (as opposed to hotels), and all of the chores associated with keeping the tours running are shared cooperatively amongst all participants, including the cooking and the shifting of luggage each day. Typically, we hire a food wrangler (or two) to drive the truck (or sometimes two trucks) and to do the food shopping and organizing along the way. Additionally, we may run one or two sag vans to support the riders. Because of this general planning template, the tours work best for those who can organize some sort of cooperative support system, similar to what our club has used. The group does not have to be as large as our club tours. It can be as small as half a dozen people, with one big van. It’s also possible for self-supported riders to do the tours. But many of the stages are quite hilly, and that would make them challenging undertakings on fully-loaded bikes. In contrast, the four Mini-Tours are designed for couples or small groups. Each is based at a central location, with all of the stages looping out from that hub and returning there at the end of the ride. The hubs always offer some sort of inns or motels for overnight stays…no camping involved. It may be possible to reconfigure some of the longer, camp-based tours so that they’ll work as inns-based tours instead. Some of these adjustments will be simple and obvious, while others are trickier but doable. Although I have not updated the routes and maps to reflect these alternate options, I have thought about them and even plotted some new routes in Ride With GPS for a few spots. So if you see a route that looks as if it might almost work for a conversion to hotel accommodations, ask me about it. I may have already done some ground work on exactly the tour in question. If you can put together a small group, with a van hauling your luggage each day, you can do a hybrid tour: stay in lodgings on as many nights as they’re available, and have your tents in the van for the few nights where there are no inns within a reasonable distance of the routes. Some of these tours have been packaged for the general public. Others are still in the form of previews specifically for the use of the Santa Rosa Cycling Club on a particular tour, and they may include dates and other logistical details that won’t be relevant for your own interests. However, the important things—the routes and the descriptions of what to expect along the way—will all be there. You just have to dodge around a little of the extra content. For more observations on cooperative group touring, read this piece I wrote about it a few years ago. Some of the financial figures have changed in the years since I wrote it, but the general information is still relevant and accurate. 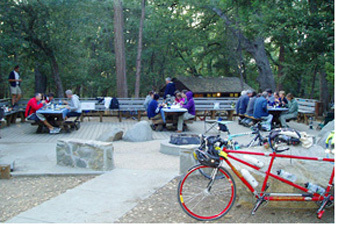 Adventure Velo tours are designed for cyclists of at least moderate fitness and experience. The routes have not been watered down for beginners or marginal riders by choosing the flattest, least challenging, “safest” options. On the other hand, they don’t go out of their way to find the steepest, nastiest hills either. Some of the longer, hillier options are quite tough, but they are often paired with shorter, flatter alternatives. Daily mileage varies from just over 50 to just under 100, with a typical stage—if there is such a thing—being around 60-65 miles.